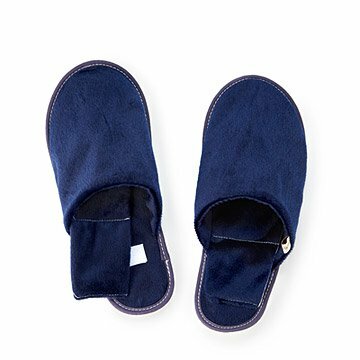 Soothe your sensitive soles with these comforting, aromatic, spa-style relaxation slippers. The soles of your feet are full of touch-sensing nerves - an estimated 100,000 to 200,000 of them - and every one will be flooded with joy when you kick off your shoes and kick back and relax wearing a pair of these soothing slip-ons. Made for pampered resting, not walking, they're not only super soft and comfy, but the insoles are filled with aromatic lavender buds and thermally conductive flax seeds. In wintertime, heat them up in the microwave and slip them on for some end-of-the-day relaxing warmth, enhanced by their lavender scent. During the summer, cool them down in the fridge and treat your feet to some sweet heat relief. These slippers are man's best friend--even a man who doesn't have a dog to fetch them for him. Slippers handmade in Argentina. Insoles made in USA. Do not leave insoles unattended while heating, allow insolesreturn to room temperature before reheating. Very thin. No padding. Insoles did heat in microwave as advertised, but were uncomfortable, bulky, uneven, hard and awkward under my feet. Returned them. Not happy with this product, it is to hard to put back in after heating product. Cannot use the inserts with other slippers, has an uncomfortable clasp inside. My dad loved the slippers, and said they were comfortable. who doesn't like warm feet! I use this product every day after taking a bath! I also use it after playing with my dog, because it relaxes my feet! It is a really great product! I would recommend it to everyone who likes to relax in style! Love them! !â�¤ï¸�â�¤ï¸� Im really happy with this purchase! Best slippers i have ever bought!